Bitdefender has always been my security solution of choice, and that is why I have posted many giveaways of its products, both for Mac and Windows. Till today, I was very happy with my free edition of Bitdefender, but why not use the Bitdefender Internet Security program, when they are giving away 180 days licenses for free. 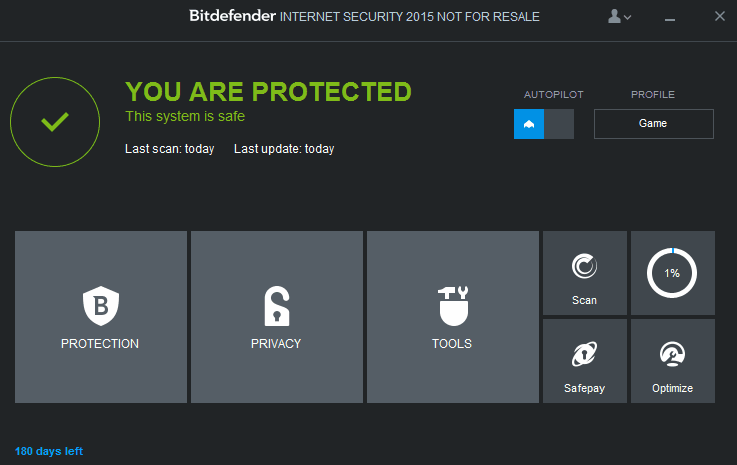 There are many great features Bitdefender Internet Security 2015 comes with. Apart from providing the best in class security from viruses and attacks, it keeps your system running at good pace, by optimizing it in many ways. It can also work in complete auto-pilot mode, and take decisions whenever it founds any problem that needs to be addressed, just to provide you a distraction free environment. Disk Defragmentation: The default Disk Defragmenter application included in Windows is not quite efficient, and that is why we search for other alternatives that do a better job. But Bitdefender Internet Security, has a built-in tool to defragment drives, and it also informs you if the defragmentation is required in the first place. Autopilot Mode: Bitdefender Internet Security (BIS) 2015 comes with an autopilot mode, which when active, will force BIS to take actions which otherwise would require your input. This makes the application work quietly in the background, so that you can work distraction free. Optimizing Your Computer: Most of us with a little technical knowledge, tend to buy programs to clean up the registry. This is because the Windows registry with errors can slow your PC big time. Bitdefender Internet Security includes a registry cleaner that cleans the registry and makes it free of errors. It also has a disk cleanup tool that deletes the junk files from your hard drive. This helps in obtaining the better processing speed from your PC, no matter how old your windows installation gets. And all of this is done with a single click of your mouse. Privacy Cleaner: We all browse stuff on the internet that we want no one else to know. But clearing everything from every browser can become a little difficult. Bitdefender Internet Security comes with a Privacy Cleanup tool that cleans all the files that can pose a privacy risk. Scan Files Easily: Bitdefender Internet Security 2015 comes with a security widget, on to which you can drop the files you want to scan immediately. The widget stays on your desktop and also reports about any problem that the program encounters. Remote Security: Bitdefender lets you scan and protect your devices remotely by accessing your Bitdefender account online. This can be done for all your devices that have Bitdefender Internet Security installed. Vulnerability Scanner: With a click of a button, Bitdefender Internet Security informs you about all the outdated programs installed on your machine. The program also informs you about any Windows Updates and security patches that are available for you to download. This makes sure that all the applications on your system have the best and the latest security fixes, and no one is vulnerable to any attack, which makes your PC secure too. Safe Search: BIS tells you about the safety of the links that are displayed on Google and Bing search result pages. This makes sure that the links you open are safe, because you know about the links even before you open them. Safego: Safego is a unique feature in Bitdefender Internet Security, that connects with your Facebook account and scans the links in your news feeds. It then prevents you from opening any malicious links that gets accidentally/deliberately shared by your Facebook friends or by the pages you follow. Smart Profiles: Bitdefender Internet Security automatically detects when you play, work or watch movies and adjusts the background apps accordingly, to give you the computing power you need. 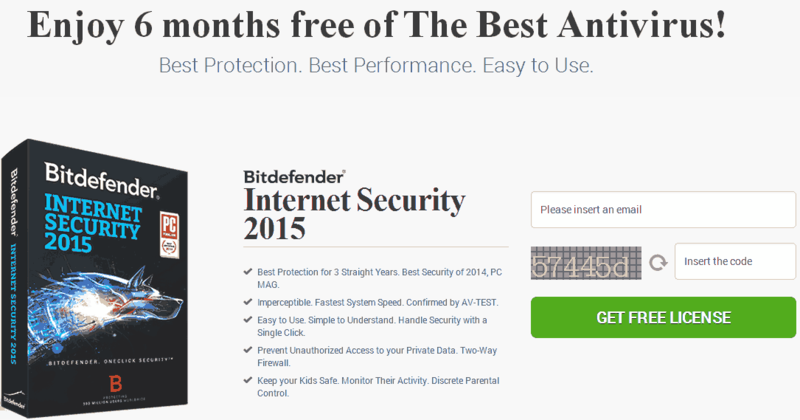 Bitdefender Internet Security 2015 is a complete security suite in all respects and you should try it once, after all you are getting a six months license for free. Fill your valid email address and the security code in the box provided. The email ID you provide here should be accessible by you, because you will get the license key for BIS at this email address. Now click the GET FREE LICENSE button and open your inbox. You will get an email from Bitdefender with the link to download the program. The email will also contain the 6 months license key to activate the product. 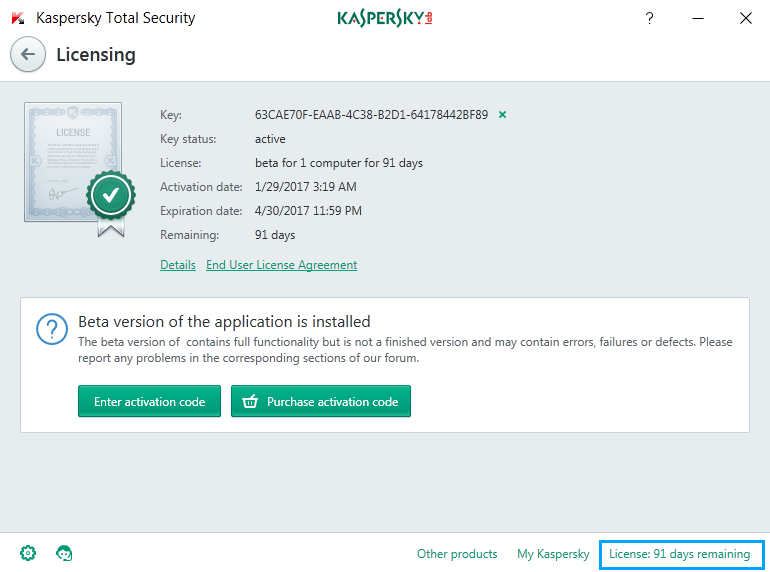 Download the program and enter the license key when the installer asks for it. It requires a minimum of 1 GB free space on your hard drive, 800 MB of which is required on the Windows installation drive. Your machine needs to have at least 1 GB of RAM installed to run Bitdefender Internet Security.